1. Cook the broad beans and peas in a large pan of boiling salted water for 2-3 minutes, until tender. Scoop them into a sieve with a slotted spoon; refresh under cold water. Bring the water back to the boil and cook the pasta according to pack instructions. 2. Meanwhile, remove and discard the outer skin from the broad beans, if liked, and set aside with the peas. Heat the olive oil in a frying pan and cook the pancetta slices for 4-6 minutes, until golden and crispy. Transfer to a plate lined with kitchen paper. Add the garlic, broad beans and peas to the frying pan and cook gently for 1 minute. 3. Drain the pasta and return to the pan. Tip in the broad bean mixture, mint and 2 tbsp parmesan, tossing together. 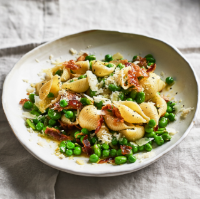 Break up the pancetta and toss into the pasta. Serve in bowls scattered with the remaining 2 tbsp parmesan and a grind of black pepper.